This article explores the dynamic of border cooperation between Peru and Colombia. It briefly analyzes some of the cooperation mechanisms and indicates, based on technical reports as well as normative and organizational analysis, that these cooperation mechanisms failed due to, among other reasons, having articulated the local and intermediary government entities in a fragmented manner in managing binational cooperation. This difficulty is even present in the most recent adaptations of the cooperation mechanisms, predicting a new failure in the efforts of both countries. Therefore, it is necessary to attempt a different manner of exercising diplomacy, in which the local and intermediary government entities play central roles in binational cooperation, in the interest of facing the structural and institutional problems established in the design of these policies, applying a cross-border focus. The Colombian-Peruvian border has a long history of tensions and neglect. Its remoteness and lack of communication combine with the memory of the Colombian-Peruvian conflict, the idea of being the rear-guard of the Colombian insurgence, and drug trafficking. These elements combine with the precarious attention to the social needs of its inhabitants, the majority of whom are indigenous. This situation appears to contrast with the intense efforts by both states to develop a) border politics that aim to be increasingly more inclusive, b) the strengthening of bilateral relations, and c) the proliferation of multilateral cooperation accords in which both countries participate. In this article, we briefly analyze some of the existing cooperation mechanisms of the two countries, emphasizing that many of the difficulties that these mechanisms face in achieving their objectives of fomenting cooperation and development are related to the nationalized institutional design that blocks real cross-border cooperation. In this sense, we suggest that it is pertinent to advance organizational strategies that tend towards effective cooperation through the border or, in turn, a cross-border government that overcomes the difficulties imposed by the nationalized understanding of international relations. Therefore, we support the consolidation of a new type of diplomacy that starts from the local to strengthen cross-border cooperation networks. Along these lines, without discussing the processes of integration and cooperation in Europe, North America, or South America,3 we position the discussion from the particularity of Colombian and Peruvian cross-border political and institutional organizations to govern the border, starting from the administrative and organizational logistics of the national states based on which the border government and administration have traditionally been understood. Thus, we turn to the proposal to construct cross-border governance, which implies the development of political-administrative and governmental arrangements that integrate the border dimension in their configuration (Sausi & Oddone, 2012, p. 241),4 in addition to the development of local diplomatic or paradiplomatic strategies (Oddone & Rodríguez, 2015), transcending the most classical development frameworks for international relations within which borders have often been understood, erasing in this path their local particularity, to understand their administration from the level of local government. Colombia and Peru participate in multilateral mechanisms and have signed numerous bilateral accords aimed at broadening the cooperation on a path towards regional integration, a goal included in the constitution of both countries (Constitución Política de Colombia de 1991, Preamble, arts. 9 and 227; Landa & Velazco, 2007). Nonetheless, the difficulties and asymmetries in the local implementation of the interstate accords show scant local cross-border coordination, causing problems to persist without a real solution. Meanwhile, despite the recent accord of the foreign affairs ministers of Colombia and Peru that outlines the possible functional structure for the implementation of the treaty in a binational commission whose head and body move through the foreign affairs ministries, with a certain level of decentralization on the Peruvian part, and a nominal presence of the intermediate levels of government (Acuerdo para la implementación del Plan de Desarrollo de la Zona de Integración Fronteriza entre la República de Colombia y la República de Perú, 2014), the functional and budget effectiveness remains unclear for moving forward with this ZIF, which could lead uncoordinated national efforts towards the border area to move forward without actually being able to connect and generate effective cooperation and integration strategies. This path appears to be the that which several cooperation mechanisms between both countries followed; to note two of these: the Convention for Customs Cooperation between the Republic of Colombia and the Republic of Peru (Convenio de Cooperación Aduanera entre la República de Colombia y la República Peruana [CCA] of 1938 and the Colombian-Peruvian Plan for the Comprehensive Integration of the Putumayo River Basin (Plan Colombo Peruano para el Desarrollo Integral de la Cuenca del Río Putumayo [PPCP]) of 1998. The first emerged under the framework of the Friendship and Cooperation Protocol (Protocolo de Amistad y Cooperación) signed in Río de Janeiro in 1934 (1934, article 4 and article 14 of the additional act), which ended the 1932-1933 conflict between the two countries. The CCA of 1938 established a list of products that should enjoy a common customs duty in the area of this convention. It was adjusted to the new conditions of the Andean Pact (Pacto Andino) with the Modificatory Protocol (Protocolo Modificatorio) of the CCA of 1938 (1981), which, in its article IX, contemplated a Mixed Study Group for the mechanism, which was translated, under the framework of the IV Reunion of the Mixed Colombian-Peruvian Commission for Amazonian Cooperation held in 1990, into the creation of a Bilateral Administrative Commission of the CCA, in which national administrative commission paths would evaluate the development and implementation of the customs accord. The National Colombian Administrative Commission was created in 1992 (Decree 0211, 1992), but its review work has been limited, as has been its continuity under the framework of bilateral relations, so much so that this Bilateral Commission was not included among the instances of coordination contemplated in the Plan for the Peruvian-Colombian Border Integration Zone, even though this plan contemplates important reforms for the Convention. This situation indicates that the institutionalization of the Commission of the Customs Convention was left behind in the initial proposals (Proyecto Especial para el Desarrollo de la Cuenca del Río Putumayo [Pedicp], 2013). However, it is important to emphasize that, in this commission, apart from the commerce and foreign affairs ministries, the governors of Amazonas and Putumayo had seats, as did the chambers of commerce of both departments, allowing a glimpse of some local participation in the mechanism (Decreto 0211, 1992). For its part, the PPCP emerged under the framework of the Colombian-Peruvian Amazon Cooperation Treaty of 1979. For the year 1988, both countries endorsed a joint declaration in which they agreed on a Bilateral Plan of Action for the development of the Amazon region that they share (Plan Colombo-Peruano para el Desarrollo Integral de la Cuenca del Río Putumayo-Diagnóstico Regional Integrado, 1993). Its objectives were aimed at attention to the isolated populations located in the basin of the Putumayo River, which showed institutional weakness, a lack of state intervention, and low economic and social development. In this sense, the objectives proposed were a) to promote the sustained development of the zone, b) to improve the quality of life of the population, and c) to integrate the zone with the territory of both countries, for which it was necessary to construct the infrastructure of communicating roads and means of transport. In addition, because the majority of the population of the Putumayo river basin belongs to indigenous communities, actions aimed at them should be prioritized, promoting the protection of rights and ensuring their comprehensive social and cultural development (Plan Colombo-Peruano para el Desarrollo Integral de la Cuenca del Río Putumayo-Diagnóstico Regional Integrado, 1993). In Colombia, the Plan included the departments of Amazonas and Putumayo, having as limiting points from Leticia to the Caquetá River. 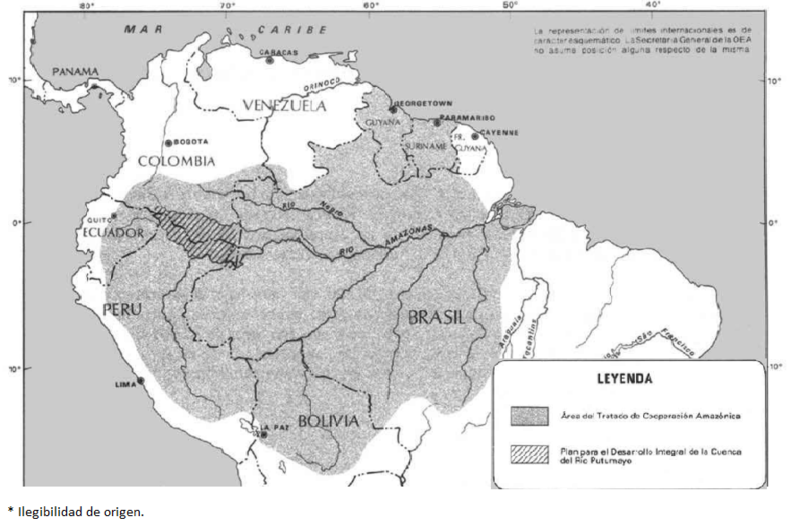 For Peru, it spanned the northern zone of the department of Loreto, reaching some parts of the provinces of Maynas and Ramón Castilla, in addition to populations based on the shores of the Putumayo, Napo, Amazonas, and Yavarí Rivers (Figure 1). Source: Colombian-Peruvian Plan for the Comprehensive Development of the Putumayo River Basin (PPCP)-Integrated Regional Diagnostic (1993, pp. 73-74). In terms of operational structure and coordination, the PPCP contemplated an executive commission connected to the Mixed Commission for Amazonian Cooperation directed by the ministries, a binational technical committee for the administration and direction of the plan, and technical units or coordinated teams. For Colombia, initially, the Institute of Hydrology, Meteorology, and Land Use (Hidrología, Meteorología y Adecuación de Tierras [Himat]) was designated and, subsequently (after its disappearance), the Amazonian Institute for Scientific Research (Sinchi); for Peru, initially, the Regional Government of Loreto, being replaced by the Pedicp, initially in the interior of the National Development Institute (Instituto Nacional de Desarrollo [Inade]) and, after its disappearance, the Ministry of Agriculture (Informe Internacional de la Auditoría en Cooperación. Plan Colombo Peruano para el Desarrollo Integral de la Cuenca del Río Putumayo, 2008; Plan Colombo-Peruano para el Desarrollo Integral de la Cuenca del Río Putumayo-Diagnóstico Regional Integrado, 1993; Plan Colombo-Peruano para el Desarrollo Integral de la Cuenca del Río Putumayo (PPCP), 1998). It is important to note that, although the declaration of the incidence area of the PPCP uses units of political-administrative organization as its base, their participation as government agencies within the plan is very limited. The participation of the Regional Government of Loreto is noted, but its functions were never enumerated, having been supplanted by a national level agency, the Pedicp. The limited participation of the local political-administrative entities and the poor connection of the inhabitants of the region are some of the elements that restricted the function of this plan, together with a broad range of budgetary, administrative, and audit restrictions that were indicated by the Fiscal Control Entities of Colombia and Peru in a joint report conducted in 2008 (Informe Internacional de la auditoría en Cooperación. Plan Colombo Peruano para el Desarrollo Integral de la Cuenca del Río Putumayo, 2008). Among the most interesting elements analyzed in the cited report, the limited binational coordination, the lack of mobility of the high-level commissions, and the limited impact of their accords stand out because they were not translated into effective actions developed by the technical commissions. Meanwhile, the report indicated that both commissions had problems with adaptation between their actions, mission focus, and the objectives of the PPCP, which made it so that the advances of the more than 20 years of implementation of the plan only resulted in two projects out of the 11 contemplated and, the worst part, the conditions of isolation, low economic connection, precarious quality of life, and environmental deterioration were not overcome (Informe Internacional de la Auditoría en Cooperación. Plan Colombo Peruano para el Desarrollo Integral de la Cuenca del Río Putumayo, 2008, p. 62). Nonetheless, the work advanced by both institutions, each in its own field, cannot be undervalued. The development of infrastructure and production programs advanced by the Pedicp are important advancements, and the work of diagnosis and research directed by the Sinchi are the basis for a large part of the investigations advancing regionally. However, the coordination problems, the national focus of action within the framework of a plan planned binationally, and the limited local participation call these achievements into question. The previous experiences lead to the argument that it is imperative to understand in a binational manner not only the real possibilities of coordination that these national institutions could have in the framework of legislation and border policies of each country but also the responsibilities and mechanisms of political and administrative coordination on a local scale to strengthen the structures of management and administration of the cross-border planning. In this path, the Colombian-Peruvian Neighborhood Commission is highlighted as a fundamental instance of coordination and, in deep connection with it, the possible organizational structures that could be created with the ZIF; however, the latter were not made real despite the existence of a Commission for the Transition from the PPCP to the ZIF established in 2009. The Colombian-Peruvian Neighborhood Commission is a bilateral mechanism created in 1994 to perform permanent follow-up, conduct analysis and the projection of schedules and commitments, and to establish the need to advance bilateral accords to facilitate the foreseen procedures to unify actions or formalize proposals and activities within the framework of the bilateral relationship. The commission was initially composed of representatives from both governments and the main business organizations from both countries, which would hold periodic meetings (Ministerio de Relaciones Exteriores, 1994, p. 1). This instrument evolved in 2003 through the mechanism of exchanging diplomatic notes between both governments, assigning this Commission, presided by the chancellors, the role of main political-diplomatic incidence between the two countries, which had to orient, coordinate, articulate, and supervise the binational mechanisms, programs, projects, and activities that would arise in specific issues of cooperation, development, and bilateral integration, with the border environment being one of the scenarios in which the activities of the Commission was meant to play an important role. This commission would have annual meetings held in alternating years in each country (Canje de notas que constituye un acuerdo sobre la redefinición del rol y estructura de la Comisión de Vecindad e Integración Colombo Peruana al fin de dotarla de mayor operatividad y agilidad en su funcionamiento entre la república de Colombia y Perú, 2003). It would be composed of two national commissions, with each having an Executive Secretary, Commissioners (high representatives of the public and private sectors of each country), and coordinators from each of the Binational Technical Committees (Comités Técnicos Binacionales [CTB]), which would be in charge of orienting and reviewing the fulfillment of the decisions adopted within them. In turn, they would be coordinated by high officials from the competent chancellery areas, with the participation of officials from the corresponding national sectors and representatives from the border zones. The CTB would hold periodic meetings (and these would be: Border Development and Integration, Commerce, Tourism, and Investment and Cooperation) (Canje de notas que constituye un acuerdo sobre la redefinición del rol y estructura de la Comisión de Vecindad e Integración Colombo Peruana al fin de dotarla de mayor operatividad y agilidad en su funcionamiento entre la república de Colombia y Perú, 2003). It is interesting to note that, in practice, these neighborhood commissions, starting in 2003, reinserted the importance of local authorities and actors (at least the most representative organization of business people) when composing the Colombian delegation to the Neighborhood Commission. However, the weight of national commercial agents in this subcommission signals that this forum was directed more towards favoring large economic groups than the border inhabitants. This can be observed with a quick review of the members of the cited subcommission at different moments since its redesign in 2003, when representatives of large companies became a part of it, and the additions made in 2007, when the new members were not designated in relation to their role as organizational or institutional representatives but rather as individuals. This composition was questioned due to the number and organizational connections of the participants in the Xth Neighborhood Commission performed in 2011, in which the representatives of the private sectors were noticeably absent and there were a great number of representatives of different institutions8 mainly at the national level, on the intermediate level, represented by the governor of Amazonas, and representatives of local civil society, including the indigenous councils (see Table 1) (Acta Final. X Reunión de la Comisión de Vecindad e Integración Colombo-Peruana, 2011). Source: Created by the authors from Decree 2791 of 2003, Decree 3157 of 2007, and Final Act. X Meeting of the Commission of Colombian-Peruvian Neighborhood and Integration, 2011. Such variation in the composition of these forums could be evidence of changes in the agendas or their internal restrictions in defining the binational agenda and the development of the public border policy, which would motivate distancing from some actors. On the other hand, the accords reached under the framework of the neighborhood commissions appear to give continuity to the programs designed in the framework of the PPCP and support the suggestions of the Mixed Amazonian Cooperation Commission. In particular, issues related to taking advantage of and structuring forest and fishing resources, as well as issues of conservation, were especially visible in the last meeting of the Neighborhood Commission held in 2011, whereas issues related to local institutional strengthening were relegated to second place (Acta Final. X Reunión de la Comisión de Vecindad e Integración Colombo-Peruana, 2011). This situation is obvious in the prioritization of projects, which is confirmed during the meetings held by the Binational Technical Committee for Border Development and Integration (Comité Técnico Binacional de Desarrollo e Integración Fronteriza [CTBDIF]) within the Neighborhood Commission, which privileged “social development” actions, particularly in the area of health, such as binational support days, the binational health plan, the comprehensive health plan, and the telemedicine and “productive economic development” project through the project of agroforestry, whereas in the “institutional strengthening” component, they concentrated on the Development Plan of the ZIF and, locally, only contemplated the “training of local authorities in project management” (Acta Final. X Reunión de la Comisión de Vecindad e Integración Colombo-Peruana, 2011). This line of action is still valid within the interior of the CTBDIF, with the Plan for the Development of the Border Integration Zone and the Binational Workdays coordinated by the Armed Forces of both countries standing out as priorities in the February 2013 meeting. This shows how the bilateral agenda is advanced between the different levels of government in an uncoordinated and poorly planned manner and expresses a latent danger for local and intermediate territorial entities in the framework of integration processes, which, despite being present in some forums that define the public agendas, have little influence over them. The scant preparation and effective participation both of local and intermediate government entities and of the civil society of the border make one think that they are not prepared or institutionally coordinated for the conditions being woven in the bilateral scenarios. Thus, the programs that have been privileged both in the Neighborhood Commission and in the CTBDIF, without underestimating their importance as a binational force to face the continued social and productive precarity of the region as well as to favor the conservation of shared ecosystems, are not strengthening mechanisms for local institutionality, given that they do not contemplate their participation or direct inclusion in the cited programs. For example, the binational workdays advanced by the Naval Forces of both countries are an “analgesic” for the precarity of the health systems on the border. This does not suggest sustained actions or permanent structural programs for health care; the same is true for the telemedicine program, which, without the technical infrastructure, qualified personnel, mechanisms for transferring patients, institutional connections and plans for inter-administrative management, has a limited field of action. Other health programs such as the binational health plan and the comprehensive health plan, which are currently in the study phase, could lead to designing more coordinated binational institutional actions in the future; however, an effective strengthening of these paths is not perceived, much less the local competencies being reinforced under the framework of binational coordination. Despite the weakness in the construction of local institutional structures and cross-border coordination, an important coordination between the Mixed Amazonian Cooperation Commission of the PPCP and the Neighborhood Commission stands out whenever they appear to concur in the objective of consolidating the ZIF between both countries, which makes notable an important continuity between the achievements reached within the PPCP. However, it appears that the restrictions on the institutional reconfiguration that can be foreseen will not manage to break the national ties with which the PPCP functioned and that led to its reformulation during the IX meeting of the Neighborhood Commission in 2009, which created the Commission for the Transition from the PPCP to the ZIF. This can be observed when analyzing the organizational structure established by the accord reached by the chancellors in September 2014 (Acuerdo para la implementación del Plan de Desarrollo de la Zona de Integración Fronteriza entre la República de Colombia y la República del Perú, 2014). This accord established a Binational Commission for the ZIF composed of Ministers of Foreign Relations or their delegates and the governors of the intermediate levels of government: the departments of Amazonas and Putumayo and, for Peru, from the region of Loreto. This commission will be presided over by the ministers and will have an Executive Secretariat composed of, for Colombia, delegates from the Ministry of Foreign Relations, and for Peru, the National Council of Development of Borders and Border Integration, presided by the Ministry of Foreign Relations of Peru, with the support of the Ministry of Agriculture and the Pedicp. On the other hand, there will be a local management committee in which regional and local institutions will participate, which will be called together by the Executive Secretariat. This structure leads to the argument that, after the criticism of the joint report of the comptrollers of both countries and against the outcry of various local actors, the institutionality to implement the ZIF continues to be an issue for the chancelleries, which design and implement through national institutions, whereas the participation of the intermediate levels of government is barely nominal-they do not have assigned functions within the functional structure of the commission. In addition, the other entities present on the local level, which include national-level institutions that operate in the area of the ZIF, can barely make “propositions,” and their effective participation in the commission depends on the desires and interests at play in the ministries, which dominate the direction and the Executive Secretariat of the mechanisms. For its part, the local border society, the beneficiary and sufferer of whatever results from this entire plan, is not even mentioned. Thus, six years after the comptrollers confirmed the restrictions of the PPCP and 12 years after both countries began the path to consolidate a ZIF, they have arrived at the same point. Although elements of the civil society of the border (such as representatives of the intermediate level of government) have been present in various forums within which the bilateral agenda was defined, their visibility and influence in them have been marginal, with the national agendas being privileged in the relationship, which is even evident in the binational action on the border. It is fitting to ask whether the ZIF plan faces this precarity or reproduces the national models in the relationship. In accordance with the different analyses of the institutional development in this part of the country, the task of clarifying, harmonizing, and consolidating the juridical-political and administrative structures and competencies of the territorial entities with action in the ZIF territory that will allow in the future a true implementation process for the integration and development of the zone is still pending (Pedicp, 2011, p. 236). Despite this diagnostic, the matrix of actors involved, developed by the Pedicp, offers a secondary weight to the intermediate and local levels of government and does not indicate their work. In Table 6 of its report, it indicates that the governance and mayoralties of Leticia and Puerto Nariño have the role of “defining programs and projects through local development plans and assigning resources to border integration projects,” adjusting to the national normativity, whereas the Regional Government of Loreto has the role of “orientating the regional development, proposing and developing corresponding strategies and comprehensive and sectorial development policies” (Pedicp, 2011, p. 243) and excludes local Peruvian governments as direct actors in the plan. The above is framed within the explicit functions of these levels of government. In both Colombia and Peru, the intermediate and local levels have planning and development functions, in addition to some specific functions in border zones. For example, for the Colombian case, article 289 of the 1991 Constitution allows departments and border municipalities to directly promote programs for cooperation and integration with the bordering territorial entity of the neighbor country, of the same level, directed towards fomenting community development, offering public services, and preserving the environment (Constitución Política de Colombia, 1991, art. 289). For its part, the 1993 Peruvian Constitution, through article 138, recognizes special faculties for the municipalities of provinces and districts located on the borders, allowing them to hold protocols and integration conventions among themselves, with their national or international counterparts, with a requirement for the latter being the participation of the Ministry of Foreign Relations, which is added to elements with established norms for political-administrative and fiscal decentralization towards the intermediate and local levels of governments in regard to the particularities of border legislation from both countries (Landa and Velazco, 2007). In this sense, the previous document does not offer anything new; it only partially presents some functions that are already included in norms, but it does not bestow upon these government entities any channel through which to efficiently coordinate with the instruments of binational action or to establish relationships with their counterparts on the other side of the border, thereby leaving unfulfilled the good intention of holding cross-border conventions through the ZIF, constraining them to national designs by failing to generate a mechanism through which effective inter-administrative cooperation could be realized on the local level. This tendency is made explicit in the ZIF Development Plan published in 2013, in which local institutional strengthening becomes noticeable on a few occasions, even though strategic objective 3 transversely refers to indigenous institutionality and strategic objective 6 concentrates on “strengthening the national (regional and local) and binational public and private institutionality of the ZIF” (Pedicp, 2013, pp. 91-92). 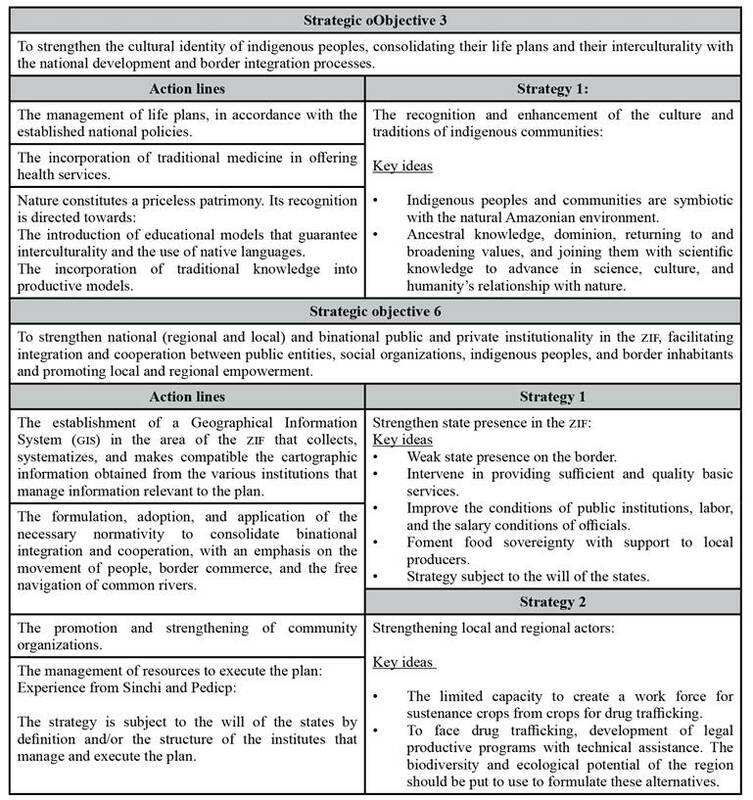 Faced with the magnitude of developing these objectives, the specific objectives and action lines fall short; they do not contemplate the already existing faculties for local institutionality, and they do not clearly develop through the programs and projects contemplated in the plan (see Table 2). Source: For strategic objective 3, created by the authors from information from Pedicp (2013, pp. 91 and 98). For strategic objective 6, created by the authors with information from the Pedicp (2013, pp. 92, 100 and 101). If we consider the above and a much more specific review of all of the strategies and action lines of the ZIF plan, it is shown that the plan does not indicate the local institutional strengthening understood as the strengthening, consolidation, or creation of local political-administrative entities, international cooperation between them, or mechanisms for cross-border integration. This tendency is reinforced in the organizational structure of the Plan, in which the three options established by the consultant displace the local and intermediate government entities from the coordination, direction, and implementation of the actions of the ZIF. This is perceived as a mechanism of local de-institutionalization because the central axes on which the majority of the Plan’s objectives are developed are superimposed over the competencies of the local and intermediate government entities in the two countries. That is, a new binational institutionality is created that acts above local planning and whose objectives are concentrated on developing social infrastructure (basic sanitation, education, and health) and generating productive processes, corresponding to the functions that local government entities already have in the legislation of both countries. Therefore, as corroborated by the Binational Commission for the ZIF (Acuerdo para la implementación del Plan de Desarrollo de la Zona de Integración Fronteriza entre la República de Colombia y la República de Perú, 2014) analyzed above, the states are making a great binational effort to advance actions that should be fulfilled from their own political-administrative organisms. Would it not be easier and more economical to design strategies to coordinate actions from the existing local institutionality? Why create something to do what the current levels of government are already obligated to do in their spheres of competence? Having reached this point, we have provided a review of some of the bilateral cooperation and integration mechanisms that have been present in the attempt to implement a public border policy for the Colombian-Peruvian border region. Although there is a tendency towards the proliferation of objectives and initiatives that are useful for the region, all have had and continue to have problems related to an institutionality that turns out to be precarious, inefficient, and limited as well as exclusive in terms of management, design, and implementation from the local and intermediate levels of government, including other actors from the border region, even questioning political and administrative autonomies, a bastion of the decentralization and sustenance of a good portion of the democracy of these countries. Things being thus, bearing in mind the difficulties and the problematic generated by this type of mechanism conceived and administered from the central levels of government, it is important and necessary to formulate integration alternatives that take advantage of the competencies already established for the territorial border entities on the local and intermediate level in both countries for the sake of establishing a new focus for public border policy in the different border regions and, in this case, specifically for the Colombian-Peruvian border region. A different path in the bilateral relationship would imply thinking of a different possible Border Integration Zone, a ZIF in which the border localities are the agents of their own destiny, where the national institutions are not executors but rather assessors of the development paths. This path is possible if the instances of coordination and agreement created in both countries are strengthened, with the coordination of Brazil being indispensable to these initiatives, in addition to the resources and management capacities of the territorial border entities. Some of the recommendations made by the Cross-Border Study Group under the framework of the “Cities and border populations: A proposal towards harmonizing public policies in the international border of the Department of Amazonas with Brazil and Peru” project (Aponte et al., publication forthcoming) reason along these lines, constituting a suggestion for the construction in a broad debate over an alternative proposal for the administration of the border under the framework of an Amazonian Cross-Border Integration Region (Región de Integración Transfronteriza Amazónica [RITA]) constructed from the local level. In general terms, the proposal contemplates that the design of the organizational structures for border administration responds to local demands and not national wishes, supporting itself in the instances indicated both in norms and in the border policies, cooperation, and integration of the two countries. That is, the Colombian-Peruvian and even Brazilian border policy should advance from the local areas through trilateral commissions in which the central government levels are participants without having in this instance the function of direction, which would fall to the intermediate and local levels of government. The coordination of the policy would be performed by a trilateral integration committee, in which the committees organized in each country would participate and would determine the specific action lines to be developed by the local territorial entities of each country, under the framework of their constitutional functions. In this proposal, the various state, supranational, and even non-governmental organizations, with functions and interests in the Amazon, could be advisors to the RITA, without having roles of coordination or direction, as proposed in other strategies, as shown in Figure 2. Source: Cross-Border Study Group, 2016. One of the most profound elements in the current transformation of the national states, in both their political plans and their administrative and fiscal plans, is that they are no longer the privileged representatives of social relations or the only actors on the international stage; today, thinking about local state administration from the border implies imagining other forms of government, new forms of public border administration that can no longer operate in Westphalian imaginings or under the assumptions of an antiquated geopolitics in terms of realistic notions of international relations. Diplomacy is no longer part of the wisdom of a prince to relate to other kingdoms, as Niccolò Machiavelli proposed many years ago; rather, it exists, at least if we try to constrain ourselves, to what is left of national states, in the mechanisms and strategies that different political-territorial administrative forms, social organizations, and actors that exercise in and, through it, develop to connect to networks and structures for all types of exchange on a planetary scale, seeking in this path new forms of government. That is, the wisdom of diplomacy in contemporary conditions and of the particularities of border places that are necessary for an adequate, democratic, efficient, and responsible government is better found among local populations and public administrations than in the larger capitals that design national policies and actions. Perhaps this has always been true, but the change in geopolitical and geo-economic conditions on a global scale has made it even more evident. Colombia and Peru have not been blind to this institutional transformation. Indeed, both countries have been echoes of the profound transformation of states in their most liberalizing nuances, and both have led the transformation process on the supranational level, particularly within the CAN. However, with some consternation, we observe that this decentralizing joy in border policy appears to be more discursive than practical, given that it does not translate such ideas into functional institutional frameworks or manifest clarity in the budgets to finance them. Thus, both the national border policies and the supranational mechanisms of the two countries pay lip service to being highly decentralizing, whereas in internal practice, they continue to be tied to the princely centralism that marked the Peace of Westphalia in international relations. Therefore, similar to Sisyphus, the Colombian-Peruvian border region continues to carry the heavy boulder of national structures without clear adaptation to contemporary conditions and local demands. If another form of institutionality for border administration and cross-border cooperation is not conceived, poor Sisyphus will eternally and fruitlessly continue to climb the mountain. 1This article is a preliminary result of the “Border cities and populations: A proposal towards harmonizing public policies on the international border of the Department of Amazonas with Brazil and Peru” project, financed by the Department of Amazonas with the support of the Inter-American Development Bank. The opinions expressed are those of the authors. 2We owe the inspiration for the analogy to the myth of Sisyphus to the work of Darío Restrepo (2001). 3As elements for the debate that are not state of the art, we suggest the following readings: for the Mexico-U.S. border zone, readings from de Peña (2004) y García (2015); para la Unión Europea Oliveras, Durà y Perkmann, (2010), Coletti (2010) y Anderson, O'Dowd y Wilson (2003). and finally, for the Latin American experience, particularly the Southern Cone, Ferrero (2006), Moreno (2012) & Sausi y Oddone (2010). 4However, it is important to indicate that one must more carefully examine the effect of the proposals for physical integration currently in intense development in South America as well as the so-called “new economic geography,” for which the cited authors have high hopes. 5The Colombian-Brazilian neighborhood was constituted in 1993. Its last actions have been related to establishing a special regime, enacted in Law 1463 of June 29, 2011 (Ley 1463 de 2011), and established by Decree 155 of 2014, which establishes a Special Border Regime ZONe, for which there are high expectations for how it ultimately develops (Decreto 155 de 2014). 6This is one of the conclusions that will soon be published from the project that sustained this article. This document recommends strengthening trinational cooperation mechanisms to break the bilateralism that blocks local accords (Aponte, Victorino & Zárate, forthcoming publication). 7As was noted in the development of the workshops held in the counterpart border localities of Leticia-Tabatinga, Puerto Nariño-Caballo Cocha, Tarapacá-Ipiranga, Pedrera-Vila Bittencourt, Puerto Leguízamo-Soplin Vargas, and El Estrecho during the second semester of 2013 under the framework of the project that served as the umbrella for this work. 8In the Commission, there were a total of 47 representatives from the Colombian delegation facing eight representatives from the Peruvian delegation, which confirms a significant asymmetry between the delegations. ☆Adriana Mayela Hurtado. Colombian. She finished her undergraduate studies in Political Science at the Universidad Nacional de Colombia. Researcher at the Grupo de Estudios Transfronterizos of the Universidad Nacional de Colombia Sede Amazonia and is linked to the School of Government and Public Policy of the Strathclyde University in Glasgow, UK. Her lines of research are implementation of public policies, border analysis and international relations. Recent publications in 2013: El desarrollo fronterizo: El concepto clave para las fronteras. In C. Chacón (Ed. ), Política y relaciones internacionales colombianas: Una mirada a la gestión 2012 (Vol. 1, pp. 11-23). ☆☆Jorge Aponte Motta. Colombian. Political scientist from the Universidad Nacional de Colombia, Master in Estudios Amazónicos Sede Amazonia y candidate for Doctorate in Geography for the Universidad Autónoma de Madrid (UAM). Researcher in training of the Geography Department of the Universidad Autónoma de Madrid and research of the Grupo de Estudios Transfronterizos of the Universidad Nacional de Colombia Sede Amazonia. Línes of research: study of the urban and border dynamics in the Amazon región. Recent publication: Tabatinga como espacio de excepción: La ciudadanía fronteriza y la condición de extranjero a debate. In T. Schor (Ed. ),Geografias e cidades na triplice fronteira Brasil-Peru-Colombia (Vol. 3).